The Platinum Jubilee of His Royal Highness Prince Aga Khan, marking the celebration of 70 years of his Imamate is scheduled to be held in February, 1954. From Qayyum Malick "Aga Khan: Guide, Philosopher.."
Islam, Religion of My Ancestors..
0001msms - His Highness the Aga Khan approaching the Platform. He is wearing the traditional robes of a ruler. 0002msms - Her Highness the Begum Aga Khan wearing the sari studded with 1,500 diamonds, worth over 45,000 pounds, with Prince Sadruddin, the second son of His Highness the Aga Khan. 0003msms - Brabourne Stadium: Prince Aly Khan seen chatting with Maharajas and Princes. 0004msms - His Highness the Aga Khan scaled against diamonds encased in bullet-proof cases on the scale. 0005msms - The specially chartered mailboat, S.S. "Vasna", which brought many thousands of Ismailis to Dar-es-Salaam on its many trips. 0006msms - Lady Battershill and Her Highness the Begum Aga Khan cutting the ribbon during the opening ceremony at the Exhibition. 0007msms - His Highness the Aga Khan during one of His visits to His followers in Diamondabad. Kampala Boy Scouts on the Left. 0008msms - On the Dais during Darbar, when important instructions were given for the upliftment of Ismailis and titles were conferred. 0009msms - Her Highness Mata Salamat Begum Aga Khan announcing the election of Ismaili Councils in Africa. 0012msms - A portion of the vast crowds of over 70,000 who saw the Diamond Jubilee weighing ceremony. 0013msms - Just after His Highness the Aga Khan's weight was matched against the diamonds in the foreground, a deafening cheer went up from the crowd of over 70,000 present. 0014msms - The diamonds in bullet-proof, transparent containers. 0015msms - Sultan Mohamed Shah, during the time when the diamonds were placed on the scale. 0016msms - Just after the presentation to His Highness of the Souvenir Diamond on behalf of Ismaili Schools in Africa. 0017msms - The magnificent arch at the entrance to the Diamond Jubilee weighing grounds. 0018msms - Mowlana Sultan Mohamed Shah addressing the congregation after the weighing ceremony in Bombay. 0019msms - The Aga Khan being weighed against diamonds during the Diamond Jubilee, 1946. 0020msms - Mowlana Sultan Mohamed Shah, addressing the congregation in Dar-es-Salaam. 0021msms - Devotional Artwork. Designed and published by Major A.J. Lakhpathy. 0022msms - Devotional Artwork. "Aly's Descendant and of Prophet's Blood." Designed by Major A.J. Lakhpathy. 0024msms - The Prince seated on the scale, against the daimonds, Bombay. 0025msms - Prince Alykhan and the ruler of Navanagar admiring the diamonds in bullet-proof cases, at Bombay. 0026msms - A view of the Diamond Jubilee weighing ceremony at Brabourne Stadium, Bombay 1946. 0027msms - Their Royal Highnesses on the occasion of the Diamond Jubilee weighing ceremony, Bombay. 0028msms - The scale which weighed the Prince. 0029msms - Their Royal Highnesses and Prince Sadruddin viewing the large concourse assembled to witness the Jubilee celebrations in Bombay. 0030msms - The Aga Khan III is weighed in diamonds, Bombay 1946. 0032msms - Public accession of MSMS on the Masnad of Imamat at the Aga Hall, Mazagaon, Bombay. 48msms - His Royal Highness the Aga Khan in a jovial mood. 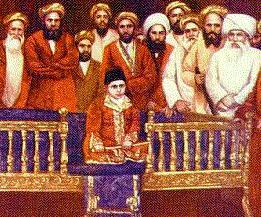 57msms - The Royal Family, from left to right: Mowlana Karim Shah, Prince Aly Khan, Princess Yasmin, Prince Sadruddin, Mowlana Sultan Mohmaed Shah, Mata Salamat and Prince Amyn Mohamed. 63msms - A photograph of His Highness taken during a public gathering in His honour.